Payday lenders have opened their wallets to the tune of more than $20,000. The Democratic Party of Arkansas. Remember when payday lenders showed their political support for Mark Pryor and his successful run for Arkansas attorney general back in 1998? More than $14,000 from payday lenders found its way into Pryor’s campaign coffers back then. Payday lenders considered Pryor a friend, although he said the contributions had no impact on his decision to take a neutral position on the Check Cashers Act of 1999. That legislation gave payday lenders breathing room a veneer of legitimacy to try and cover judicial rulings that called their business practices usurious and unconstitutional. 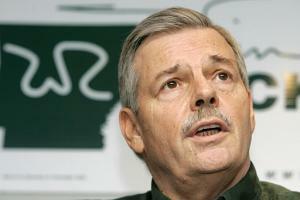 Payday lenders haven’t given any money to Mike Beebe, Pryor’s successor and Democratic gubernatorial candidate. Nor have they shown any financial love for the Republican Party of Arkansas. Asa Hutchinson, Republican candidate for governor, has spoken openly about his opposition to the usurious lending practices of payday lenders. Beebe has taken an oh-so quiet “neutral” stance that bears a striking resemblance to Pryor’s. Where is the AG’s consumer protection conscience in the matter? Some say it left the building with Winston Bryant, Pryor’s predecessor. Harry Reid is taking the floor. A stunt or a coup? Harry Reid is trying to score. 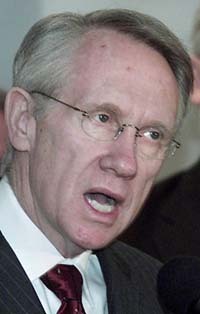 But it's no secret to leak - Harry Reid is really a bore. Entergy rates on the rise? The Truth has posted several stories about Entergy and the Attorney General of Arkansas, Mike Beebe...it seems that Mike likes to accept money from utility companies that he regulates. I Wonder Why Entergy Is Able To Raise Rates? Federal regulators Monday affirmed a ruling expected to cost Entergy Arkansas Inc. customers hundreds of millions of dollars a year starting in 2007. As a result, Entergy Arkansas officials told the Arkansas Democrat-Gazette they will exit the “system agreement” that led to the predicament, leaving the other four Entergy Corp. subsidiaries behind. Formed in 1982, the pact lets Entergy Corp. utilities in four states share production costs and generation capacity. But it also has sparked legal battles that have sent billions of Entergy Arkansas ratepayers’ dollars to other states. Barring a successful appeal of the ruling, leaving the agreement won’t protect Arkansans from likely paying $143 million to $210 million annually for seven years to subsidize plant costs in Louisiana — estimates based on natural-gas prices at the end of October, Entergy Arkansas President Hugh Mc-Donald said. That’s because it could take until late 2013 — eight years at most — to withdraw completely, he said. Meantime, Entergy Arkansas plans to petition the U.S. Court of Appeals in Washington, D.C., within 60 days, said Mary Cochran, general counsel for the Arkansas Public Service Commission. The move came hours after the Federal Energy Regulatory Commission said it stands by its June 1 ruling that production costs between Entergy plants in Arkansas and Louisiana are not fairly distributed and that Arkansans must make up the difference. Initiated by Louisiana regulators in 2001, the dispute stems from the fact that Entergy’s Louisiana plants rely mostly on natural gas to generate electricity, while most of its Arkansas plants rely on coal and nuclear power. In recent years soaring natural-gas costs have made Louisiana plants more expensive to operate under a system that requires Entergy to fairly distribute operating costs in Arkansas, Louisiana, Mississippi and Texas. During the mid-1980 s, a similar cost-sharing decision by the federal commission resulted in Entergy Arkansas customers paying more than $3 billion toward the Grand Gulf nuclear power plant in Port Gibson, Miss. Arkansas contends that production costs are roughly equal. At the same time, the Arkansas commission is pleased that the federal commission clarified an effective date of 2007 — rather than 2006 — for cost adjustments to be made if Louisiana plants fail to operate within 11 percent above average costs for Entergy’s fourstate system, she said. Louisiana’s generation plants operated at an average of 33.6 percent above the entire Entergy system between 2000 and 2002 at a time when natural gas prices were far less than they are now. The federal body also stood by its decision to reverse an earlier finding that a hydroelectric plant near Vidalia, La., was a systemwide resource and that the costly facility was built to benefit only Louisiana. Yet attorneys arguing Louisiana’s case took heart in the ruling as well, noting that the federal commission threw out part of its rationale for expanding the 11 percent threshold from a 5percent to 7.5 percent margin established in 2004. “We feel we have a good chance to improve our position on appeal,” said Michael Fontham of New Orleans-based Stone Pigman Walther Wittmann LLC. “FERC withdrew the main part of their reason for establishing the 11 percent band width, but gave no substitute. They ruled against Vidalia, but didn’t say why. A departure from the system agreement does not mean that Entergy Arkansas’ role with its parent company will change in any other way, vice president of regulatory affairs Steve Strickland said. LITTLE ROCK -- U.S. Rep. John Boozman left Monday for a trip to Iraq to visit Arkansas troops and talk with Iraqi cabinet members about the nation's elections. Boozman, R-Ark. left early Monday with five other congressmen, including Louisiana's Charles Boustany Jr., R-Lafayette, to visit Iraq, Boozman's spokesman Patrick Creamer said. The trip's delegation included two other Republicans and two Democrats. The trip, led by Rep. Tom Osborne, R-Neb., will focus on the impact of last week's parliamentary elections. "That's going to be the major issue discussed," Creamer said. "He wanted to get a feel from the Iraqi officials about the progress that has been made in the country." Boozman will be in Iraq until Friday and is expected to visit with Arkansas troops during his trip. "He wants to make sure that our troops are getting what they need out there," Creamer said. Details of his trip were not being released for security reasons, Creamer said. This week's trip is Boozman's fourth to Iraq since the war began in 2003, he said. 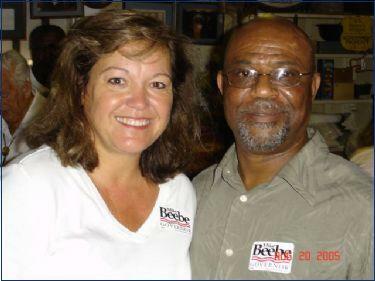 "Harvey's Grocery - Susan McDoogle & Rep. Willie Hardy"
FYI - Correct Spelling: McDougal Does This Remind Anyone Of Another Beebe Campaign Spelling Mistake? Why would someone running for Governor of Arkansas post a picture of Susan "McDoogle" on their campaign website? Remind you of another Arkansan that was a friend of Susan "McDoogle"? Margaret Friedenauer is a reporter for the Fairbanks News-Miner, and is currently embedded with the 172nd Stryker Brigade in Iraq. In addition to whatever reporting she's producing for the newspaper, she's also blogging her experiences. Yesterday, she put up an interesting entry on "The view from on the ground" which was enlightening in ways she intended, and also in ways that I don't think she intended. It dealt with the situation on the ground in Iraq, and the comment she had was that "everything I thought I knew was wrong." "Think about everything you’ve heard about the conditions in Iraq, the role of U.S. forces, the multi-layered complexities of the war. Everything I thought I knew was wrong." LITTLE ROCK (December 14, 2005) – Today, the Republican Party of Arkansas began a series on the “Mike Beebe Record” that will provide the real background of Beebe’s record as a public servant. This tool will be important to voters and activists as the Republican Party looks at the real records of public officials over the course of the next several months. Richard J. Peltz, associate professor of law at the University of Arkansas at Little Rock’s William H. Bowen School of Law, will be the guest speaker at the Arkansas Policy Foundation’s luncheon on Thursday at Cheers on Broadway in downtown Little Rock. Peltz, co-author of the book The Arkansas Freedom of Information Act and an adviser to the Arkansas Press Association, will discuss the Freedom of Information Act and ideas for expanding the public’s right to know. He teaches torts, constitutional law, First Amendment and Freedom of Information law. The luncheon begins at 11:45 a.m. Admission to the luncheon is free, but attendees are responsible for the cost of their meals. -Earlier this year, the Governor's Mansion Commission declined to release information about publicly funded expansion plans for the governor's residence by citing the working papers exemption. Peltz said last month the commission couldn't claim the exemption. "Politicians always want to aggrandize their power and advocates will always push back," Peltz said. "I don't think we're outside of the natural order of things with that yet, but some would disagree with me." Before he became attorney general in 2003, Beebe was a state senator from Searcy who often complained about how Huckabee flaunted the working papers exemption. Now, he generally declines to assess Huckabee's handling of FOI because Beebe would be the governor's lawyer if he were sued. But he did let some criticism fly in an interview with The Associated Press this week. "There are instances from time to time where I wonder about it," Beebe said. "The mansion commission issues in recent months come to mind as something that raised my eyebrows. I don't believe the mansion commission's work is exempt." And Beebe has been known to cite the very same exemption to decline requests for government information, such as correspondence from or to tobacco companies regarding payments to the state under the national tobacco settlement." For months, White County, especially Searcy, paid [much] more [for a gallon of gasoline] than was being paid elsewhere. I think the reason for this can be traced to the gasoline suppliers. Multiple thousands of dollars were made by someone, and supply and demand does not offer an adequate explanation. The attorney general, Mike Beebe, is from here. If he is concerned about justice, he should make a thorough investigation of the matter. If he fails to do it, I doubt that he will carry White County when he runs for governor, whoever his opponent may be. I think I speak for hundreds of other White Countians as well. One might think that common sense stemming from a fear of breaking the law would be enough to prevent a public employee from using his or her time and/or state-issued equipment for campaign related activities. Judging from what I discovered on Mike Beebe's gubernatorial campaign Web site and the response from his campaign, common sense can take a vacation. If one were to go onto the Web site (www.mikebeebe.com) and click on the text "Mike Beebe for Governor Press Kit," under the press section, one would be directed to a list of downloadable documents. After downloading the documents onto one's computer, one could drag the cursor over these particular documents. In doing so, it would be revealed that the author of the document, titled "Beebe Speech Final," is none other than "ARAG" - as in Arkansas attorney general. I went through the drill several times. It is worth mentioning that David Eichenbaum's name popped up on the other documents, which makes sense. He is Beebe's political consultant. Monday afternoon, I called Beebe's campaign, hoping someone could clarify what I had observed. What computer was used to write the speech? Was it a state-issued computer? Was it a campaign computer? Was it a personal computer? Did the attorney general or a member of his staff violate the law? Chris Masingill, Beebe's campaign manager, said he would find out. I also called the state attorney general's office seeking clarification. Masingill called back Wednesday, indicating that a state computer had been used to write the campaign speech. "It appears that the day before the official launch, an attorney general's office staff member used a computer at the attorney general's office after hours to make final changes to the general's (campaign) announcement speech," Masingill said. He did not know which staff member used the state computer to work on the speech. He emphasized that members of Beebe's campaign did not use any state facilities or equipment to write any part of the speech. "General Beebe has reminded all members of his attorney general staff not to use any state equipment for any work connected to the Mike Beebe for Governor campaign," he said. "This was very much an isolated incident; the policy has been reinforced by the attorney general himself." Monday, a state Ethics Commission staff member said that the commission has issued opinions dealing with elected officials, or employees on the public payroll, using public property for campaign purposes. The staffer pointed me to the law. The rules governing Arkansas public employees' time and use of public property for campaigning are fairly straightforward. Arkansas Code 7-1-103 (a)(2) states: "It shall be unlawful for any public servant ... to devote any time or labor during usual office hours toward the campaign of any other candidate for office or for the nomination to any office." Section (a)(3) states: "It shall be unlawful for any public servant ... to use any office or room furnished at public expense to distribute any letters, circulars, or other campaign materials unless such office or room is regularly used by members of the public for such purposes without regard to political affiliation. It shall further be unlawful for any public servant to use for campaign purposes any item of personal property provided with public funds." Masingill thanked me for pointing out what I had found and indicated that the problems had been fixed. "It's disappointing that Attorney General Mike Beebe and his political operatives in the Democratic Party are distorting Asa's record of achievement already, but we expect plenty more to come. "Anybody who takes on the kind of tough missions that Asa Hutchinson has taken on – whether at DEA or Homeland Security – opens himself to attacks by political opportunists. Asa's mission at DHS was to ensure that no new terrorist attacks occurred on American soil. None did. Is there more that needs to be done? You bet. Securing our families and communities from another terrorist attack must be an ongoing process. However, this country is safer today than it was before 9/11. 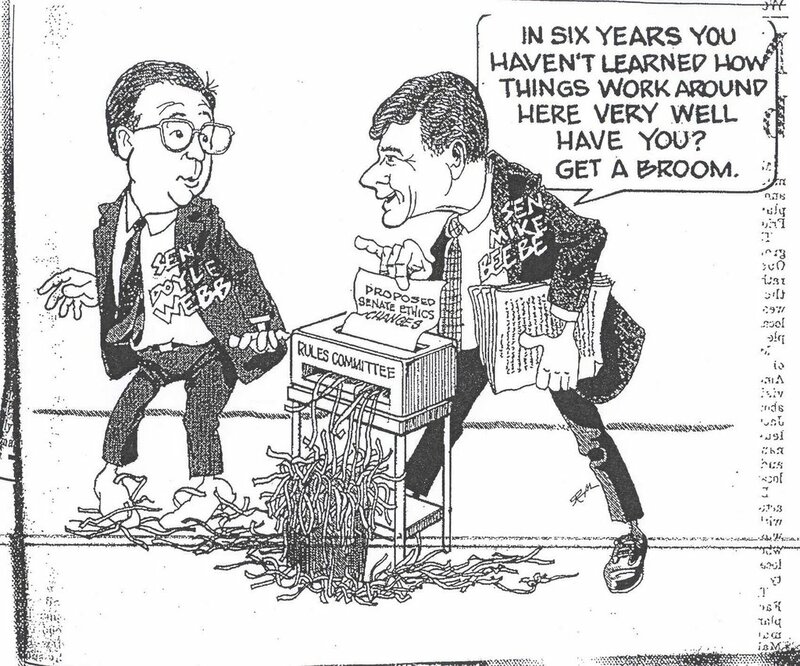 "Compare Asa's record of achievement to the attorney general's. What does Mike Beebe stand for? Nobody really knows. "This is the key question: What kind of Governor do Arkansans want – one who is willing to take on the tough challenges leadership requires, or one who shrinks from tough choices because of the risks they pose to his political career?" Will illegal immigrants be gays of 2008? Democrats of more cynical persuasions believe that George W. Bush took out after illegal Mexican immigrants last week not only for the obvious reason, which was to change the subject from his vast failings. The Truth received an e-mail stating that the Republican Party has started a blog. RPA, the blog looks great! Keep up the good work! Possible candidate Bill Halter of North Little Rock filed his second monthly exploratory committee finance report Wednesday. It shows he raised $142,085 in October. The vast majority of his contributions came from out of state. He reported $4,535 — less than 5 percent of his donations — from Arkansans. “Bill Halter is not yet even a candidate but he is already demonstrating an ability to bring resources into Arkansas rather than pull them out,” Halter spokesman Bud Jackson said. Halter, a Democrat and a former administrator at the Social Security Administration under President Clinton, has filed an exploratory committee for the governor’s race. The only announced Democratic candidate for governor in 2006 is Attorney General Mike Beebe. The only announced Republican candidate is former U.S. Rep. Asa Hutchinson. As announced candidates, their reports are due quarterly, not monthly as is the case with candidates with exploratory committees. The next quarterly report isn’t due until Jan. 15. In total, Halter has raised $649,263. Less than $30,000 is from Arkansans. Beebe has raised $1.77 million and Hutchinson $632,449 through September. About 11 percent of Beebe’s contributions for the third quarter were from out of state. Hutchinson’s percentage of out-of-state donations was about 12 percent. Halter also pondered a run for governor in 2002 but did not make the attempt. That year, he formed no campaign committee. Halter spokesman Bud Jackson on Tuesday wouldn’t say whether Halter might change his mind and run for something else. Jackson said Wednesday that Halter declined to address that question. Jackson wore a sticker on his jacket that said “Halter for Arkansas: The Right Choice for Constable.” He said it was his way of showing that the Halter committee has a sense of humor. Halter’s exploratory committee is called “Halter for Arkansas.” His initial filing setting up the exploratory committee lists governor as the office he is thinking about seeking. But his finance reports make no mention of what office the exploratory committee is for. His campaign literature also uses the generic “Halter for Arkansas” label. Graham Sloan, executive director of the Arkansas Ethics Commission, said candidates with exploratory committees can only use the money to run for the office for which the committee was set up. If such a candidate chooses to run for another state office, the money in the exploratory committee must be given to either the state treasury, a state political party, a nonprofit organization, or refunded. Federal Election Commission spokesman Ian Stirton said candidates can’t transfer any money from a state account for use in a federal race. Halter has obtained numerous contributions from California, the home of Stanford University, where he received his bachelor’s degree and for which he was a trustee. His largest Arkansas contributors in October were R.L. Qualls of Little Rock, a retired president of Balder Electric Co., and Nancy Ann Qualls, a retiree from Little Rock. Each gave $2,000. Halter, 44, recently bought a $350,000 house at 2912 Timber Creek Court, North Little Rock. He previously lived in Washington but kept his voter registration in Arkansas listed at his father’s house in North Little Rock, where he grew up. He plans to marry Shanti Patching of Elk Grove, Calif., on Jan. 28.